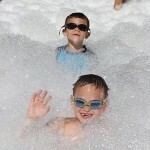 Foamtastic – One of our special events is a big foam party! Foamtastic happens twice a summer (see photo). Why “Foamtastic?” It’s Foam and it’s Fantastic! Uncle / Aunt – Campers often call their counselors “Uncle Chris” or “Aunt Kelly.” It is an old camp tradition to prefix counselors names with Uncle or Aunt. This has been Playland verbiage since Uncle Walter and Aunt Pearl started Playland in 1957. 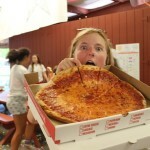 Of course campers are not required to call their counselors these names… it just sort of happens. The power of tradition! Ikes! – If you are near karate in the southwest corner of campus, you will hear “Ikes,” not “Ay-ya!”” Sensei Anthony began teaching karate at Playland in 2013, and this is his phrase for practicing punches, kicks, and everything in between. CampMinder – CampMinder is Playland’s camp management software. Parents register through the camp website using CampMinder. You might hear Uncle Steve telling a parent, “You may request friends to be grouped with through CampMinder.” Head Counselors will use CampMinder to quickly find what groups campers are in or where they are on campus, so “CampMinder” is often said on the walkie-talkies. Daddy Jump – According to Uncle Marshall from the deep pool, “Daddy Jumps” were the most popular way of jumping off of the diving board. Not cannon balls or can openers, “Daddy Jumps.” Marshall says there is no way to know what a “Daddy Jump” is because it always looked different. Sounds like fun! Gimp – Some camps call them lanyards, we call it “gimp.” You can find gimp at Arts & Crafts. Box, tornado and zipper are popular stitches. L1 / L2 / L3 – These are the three sections of the L shaped pool that campers going to Kindergarten and 1st grade swim in. 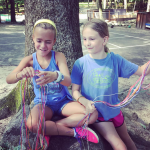 SFI – Ask a counselor what SFI is and they’d best respond, “Safe, Fun, Instructional.” This is the Playland philosophy and the directors harp this at orientation and through the camp season.